TAOIST ceremonial robes | Send an eCard! 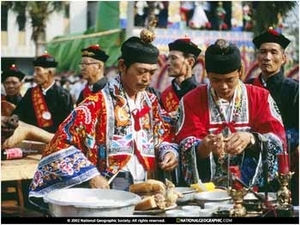 Taoist ceremonial robes worn by priests are a stunning work of art designed to transform the area around the altar from an ordinary space into a celestial court. The priest acts as a bridge between the human and spirit worlds to renew a good relationship between the people of his community and the gods.